Panchet Dam is an earthen dam constructed on Damodar River at Panchet. The dam was constructed under the highly popular and ambitious multipurpose river valley project, called the Damodar Valley Corporation (DVC). The overall project was taken as the first river valley project in post independent India that included a number of dams, hydro power stations and a barrage. 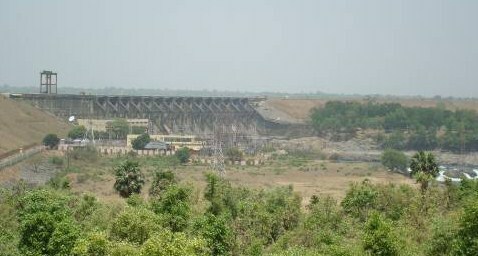 The Panchet dam site is located in District Dhanbad, State Jharkhand and was commissioned in 1958. The site is about 20 KM from Asansol an industrial town of West Bengal. The dam and its catchment area fall in both Jharkhand and West Bengal State of India [1, 2, 5]. In 1953, 34,000 acres of land spread over villages in Bengal and Bihar (now Jharkhand) were acquired for this dam. Around 73,650 families living in over 100 villages 30-35 in Bengal were affected . Beside this, about 20 or more temples located in the place known as ‘Bhairabsthan’ on the catchment areas of the dam has been submerged. From the archeological perspective this was a catastrophe apart from ecological damage . Project Details The dam is about 40.84 meter in height and about 6777 meter in length. The reservoir traps a catchment area of 10.961 sq kilometer. The annual average annual basin precipitation is 114 cm and the average annual run off is 4540 million cubic m. At the dam site, the maximum observed flood (June 1949) was 8558 cusec. For the project, the spillway design flood that was adopted was 17853 cusec. Two units of 40 MW has been installed at the power house for generation of hydropower [1,2]. Why? Explain briefly. The affected families had been told that they would be compensated, but nothing has happened. DVC officials said the corporation had given jobs to 4,862 affected villagers in the 1950s. Then, in 1977, a compensation package was announced and jobs were given to another 102 people. DVC officials also said that affected villagers will be considered if they show valid documents of their possession. Local Member of Parliament had raised the issue in Indian Parliament and urged DVC to employ the kin of those affected. Other local political leaders are skeptical about DVC’s intention. They expressed their doubt that many of the affected landless people are now too old to work. So the compensation packages for these people are irrelevant now after so many decades .